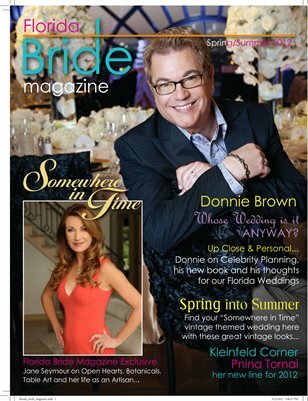 Florida Bride Magazine is designed to WOW brides to be! Its pages contain a reservoir of information from their engagement to their honeymoon. The magazine is full of the latest fashion trends from the top designers in the industry. Designers such as kate spade, Issac Mizrahi, Pnina Tornai, Alita Graham and Chanel to name a few. Brides can view choices for their color palettes, what jewelry they will wear, the style of bridal gown that best flatters their figure, hair styles and more. Brides are consistently searching for the best in the business to make their day an unforgettabe one, and that is exactly what they will find from the vendors in Florida Bride Magazine.